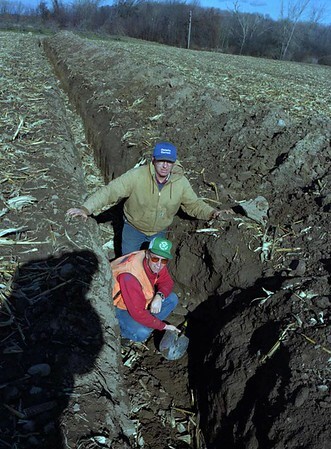 Charlie Pettit (standing) was laying new drainage pipes when he found an old one made out of sandstone, used during the quary days. David Reckahn, with the Orleans County Soil and Water Conservation District sticks the shovel's handle in the open drain. REWRITE CUTLINE HOW YOU FEEL BEST.